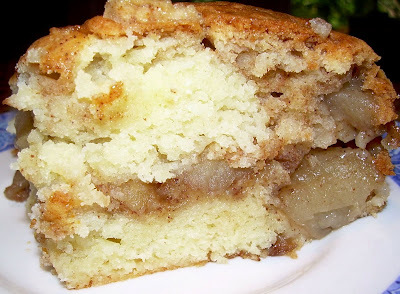 TWD – Apple Pie, Double Apple Bundt Cake, and Muffins! I have been so busy, my life has been interfering with my cooking and baking, and that’s what life should be about, don’t you think? Ha! At any rate, over the next couple weeks, I will be posting not only the weekly TWD dish, but others that I made but did not have time to post. 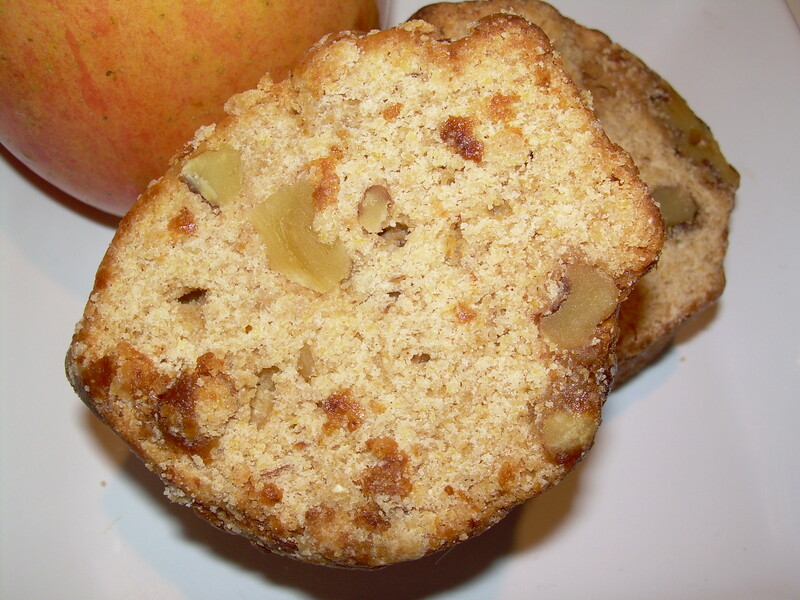 So, today, in addition to a fantastic apple pie, I’m also posting the Double Apple Bundt Cake and coffee-less muffins. 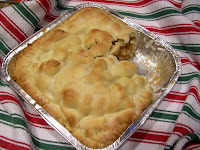 First, this week’s All-American, All-Delicious Apple Pie on pages 300-302, chosen by Emily of Sandmuffin. Really, the only change I made was to eliminate the crumbs, and double the tapioca to four teaspoons, since I can’t stand a runny filling. This pie was outstanding, and both my honorable husband, Master Chow, and I thought the addition of the lemon zest is what made it so good. I’ve used lemon juice in the past, but from now on I will use the zest. 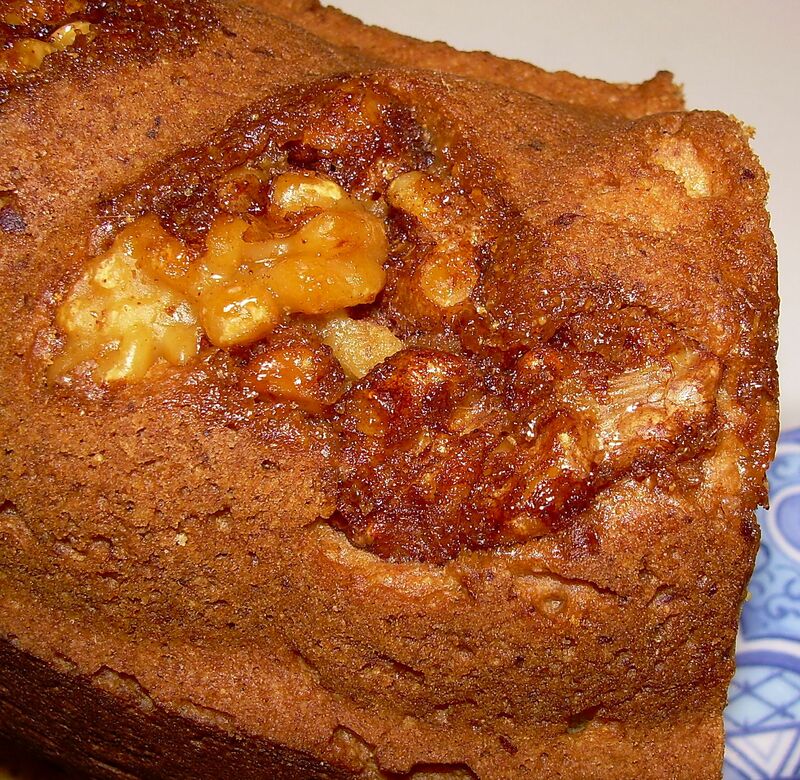 A couple weeks ago, TWD baker Lynne of Honey Muffin chose Double Apple Bundt Cake on pages 184 and 185. Another winner, and the flavor really mellowed overnight. I did not have apple butter, but I did have a jar of this pumpkin butter on hand and I needed to use it up. 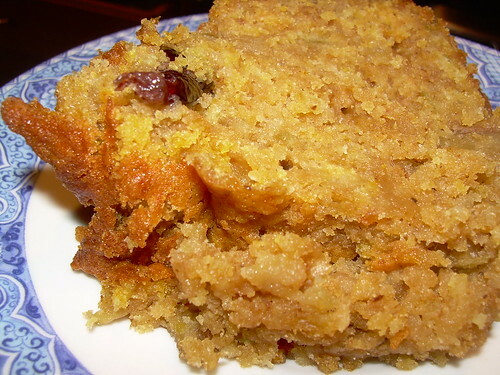 Absolutely delicious, and I also substituted dried cranberries for the raisins. Yum. Finally, from back in September, I made the Coffee Break Muffins that Rhiani of Chocoholic Anonymous chose. Except that I eliminated the coffee because my husband hates coffee. So, I substituted 1/2 cup of orange juice and 1/2 cup of milk for the coffee, and added the zest of an orange and 1.5 cups of frozen cranberries. Voila! Orange cranberry muffins, that also go on the repeat list! I have to thank Dorie and all the TWD bakers for their wonderful choices. It is so much fun to bake things that are so successful your family wants you to make them again! Between family health issues, appliance failure, and just the general hustle and bustle of everyday life, posting last week for TWD slipped away from me. 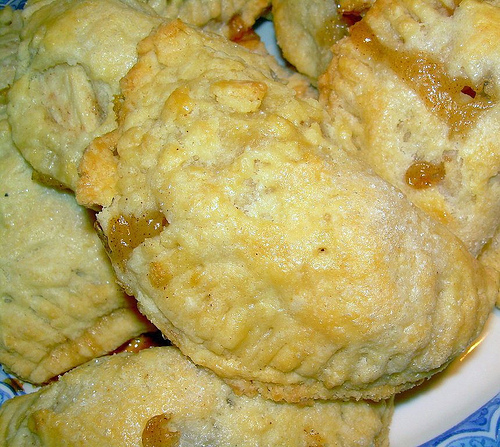 But I knew that I just had to make these – Jules from Someone’s in the Kitchen picked Flaky Apple Turnovers, from pages 316 and 317 of Baking: From My Home to Yours. I made the full batch of dough, but froze half of it for future use. 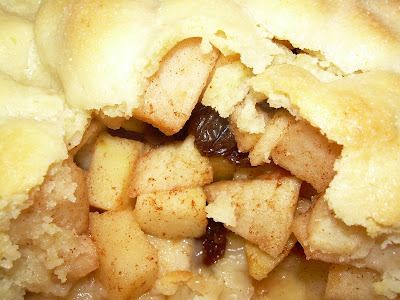 I debated swapping the apple filling for a jam filling, but I had a couple old apples sitting about that needed to be used up. 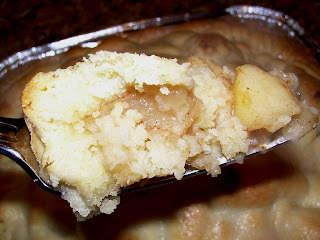 My only changes to the filling recipe were to halve it, and to add the juice of one lemon. I ended up with about 10 turnovers. THESE TURNOVERS ARE OUTSTANDING. Not the best looking pastries I’ve ever made, but delicious. Definitely, without a doubt, in my top five Dorie favorites, and they will be on the repeat list. After all, I have half a batch of dough sitting in the freezer! Check out Jules’s blog for the original recipe. My mom was a twin, and her twin is my favorite aunt, Tia D. One thing I inherited from them is a love of cooking, especially baking. When my mom was still alive, she would go visit my aunt and they would hit all the estate sales, thereby adding to their impressive collection of bake-ware. Thank you so much, Tia D! Of course, I was just itching to make something, and hopefully Clean Out the Pantry, as well. One of the recurring features of this blog is something I call “Cleaning Out the Pantry.” I really dislike wasting food – both of my parents grew up during the Great Depression, and their attitudes about food and waste certainly affected me. So, when I see odds and ends that need to be used up, I start hunting for appropriate recipes so that nothing goes to waste. I also wanted something wholesome (okay, no laughing in the peanut gallery!) 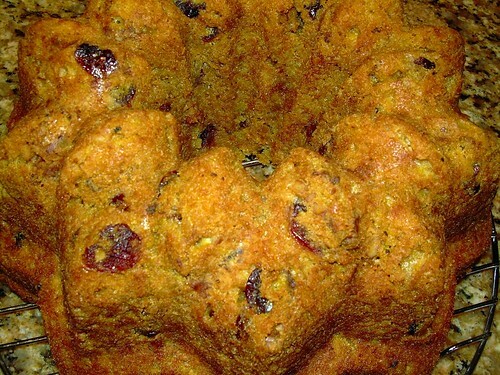 , so I turned to my wonderful King Arthur Flour Whole Grain Baking: Delicious Recipes Using Nutritious Whole Grains . 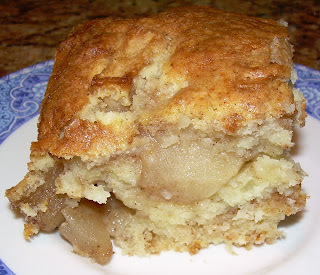 More after the jump . . . .
continue reading "An Apple Butter Cake and Family"
What a littl e marvel this is! 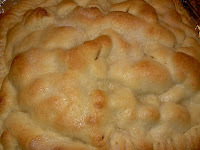 At first I thought, “this is just a pie!” Well, it is, but with an amazing, puffy crust. Nothing competes with the flavor of the apples. It’s not rocket science to bake (although after the pecan biscuits, who am I to talk?) And it ended up tasting like an old-fashioned, homey, lovely little dessert. 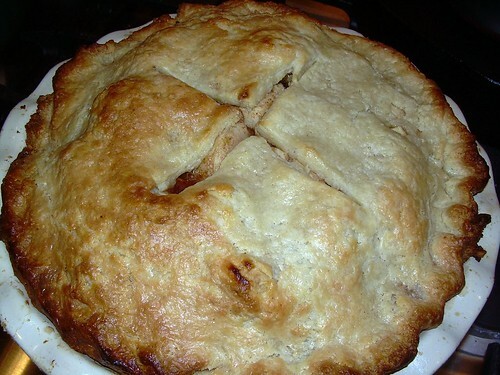 I love the crust – very soft and pliable, which allowed it to conform to the filling, thereby eliminating that pie “gap” that often occurs between the filling and top crust when you make an apple pie. 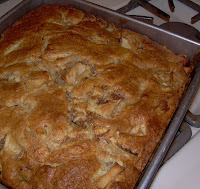 I made some adaptations to the recipe: (1) cut it in half, and baked it in a disposable 8-inch square pan, (2) used 4 Granny Smith apples and one Fuji, half the amount of raisins, all the sugar and cinnamon, and (3) added the zest of half a lemon to the crust. Then I mounded the filling over the bottom crust, and the pie/cake for about 35 minutes. The smell that filled the house was fantastic. I should mention that I rolled out the soft and sticky crust between two sheets of plastic wrap, after making it in my food processor. Dorie says to let the cake cool to “warm” or “room temperature.” Riiiiight. In my book, that was about five minutes, and then I dug in. Did I mention that I was baking this at 9:30 at night? Mmmm. It was only through sheer force of will that I stopped myself to take photos of my soon-to-be-gutted little wonder. If you look closely, underneath the crisp surface of the crust, the texture is a bit “cakey.” Maybe that’s where the name comes from. Thanks to Natalie of Burned Bits for this week’s selection, and you can find the original recipe over at her blog. I agree with Natalie that this would be even better with some ice cream or some cream. Next week, Peabody has chosen Brioche Raisin Snails! And be sure to check out the Tuesdays with Dorie blogroll to see everyone else’s creations! Like many out there in the culinary blogosphere, I have an overburdened bookshelf, creaking under the weight of all the cookbooks I fully intend to use, but rarely get around to doing so. One of my reasons for starting this blog was to pull some of these tomes down and take them for a test drive. The winner this month? The Williams-Sonoma Collection: Muffins (Williams Sonoma Collection) , by the wonderful and prolific author, Beth Hensperger. It’s a little book, but the recipes are clear, easy to follow, and obviously thoroughly tested because they work. There’s a picture for every recipe, which makes it even more fun to read the book. I always wonder why publishing houses skimp on food photography, when a little more effort in that direction would help the book fly off the shelves! The book is divided into six categories: Classics, Fruit Muffins, Vegetable Muffins, Savory Muffins, Coffee Cakes, and Quick Loaf Breads. I made the Spiced Apple Coffee Cake you see at the top of this post, as well as the Blackberry Muffins (for which I substituted blueberries and orange zest, and they turned out fantastically well). The cake was intensely flavorful, and so moist that I could eat it frozen (and I did), and it still had a soft texture. It froze very well, retaining all its flavor and a pudding-like texture. Dang, I just made myself hungry again. 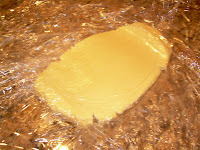 To freeze, I recommend wrapping in plastic wrap, then foil, then placing in a freezer storage bag. The original recipe includes a vanilla glaze, which I eliminated because the finished product was sweet enough. 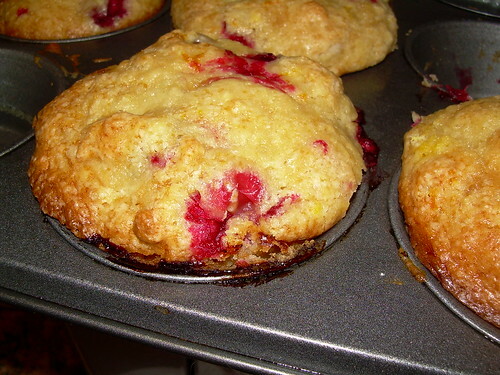 I also tried the luscious blackberry muffin recipe, but substituted blueberries, and orange zest for the lemon zest. Master Chow loved these. They didn’t hold up quite as well in the freezer, but I suspect that may because I didn’t wrap them in foil, a mistake that I won’t repeat. The recipe called for a whopping 2 cups of blueberries, but there was enough batter to hold them together well. 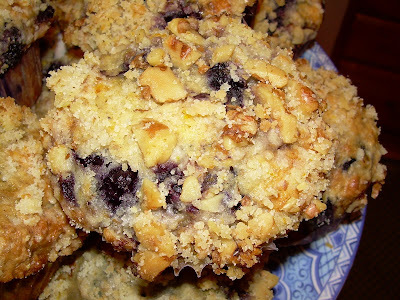 The orange was a wonderful complement to the berries, and each muffin was topped with a walnut crumb mixture. Delicious! Tonight, I’m going to try either the Polenta Muffins with Fresh Herbs, or the Tomato and Goat Cheese Muffins. Hhhm. Decisions, decisions! One final note: if your spices are old, do yourself a favor and treat yourself to some new ones. It will make a world of difference in your baking! Preheat oven to 350 F (180 C). 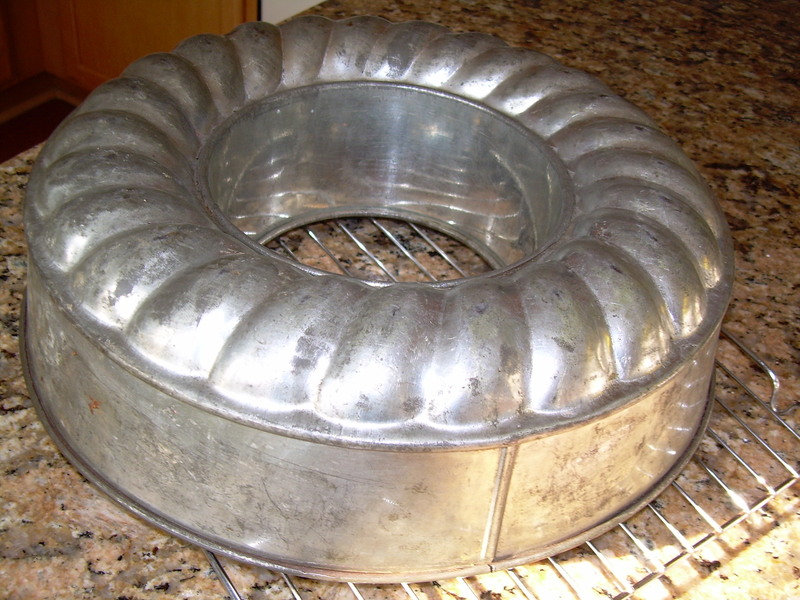 Thoroughly grease and flour a 9-inch square baking pan, or a 9-inch round spring form pan. This is a very wet batter, and if you slack off on this step, a lot of your cake will end up sticking to the bottom of the pan! In a bowl, stir together the flour, baking powder, and salt. In another bowl, toss the apples with the juice. In a third bowl, stir together the brown sugar, cardamom, and cinnamon. Add to the apples, toss to coat, and set aside. In another bowl, using an electric mixer set on medium, cream the butter, Neufchatel cheese, granulated sugar, and vanilla until light and fluffy. Add the eggs one at a time, beating well after each addition. Add the dry ingredients in two or three increments, beating well until just smooth. Don’t over beat the batter. Using a spatula, gently mix in the apples, just until they are incorporated. You want things to be mixed, but not over mixed, or you will have a tough cake. Spoon the batter into the prepared pan, and bake for 60-70 minutes. A toothpick inserted into the center of the cake should come out clean. Cool on a cooling rack for about 5 minutes, then carefully remove the cake from the pan.